Tonight was building the most Dice Mastery Team of Dice Masters that I could. I wanted to roll stuff, so I went with something I have been wanting to try out: Orbital Strike. This is one of those double edged sword-type Basic Actions. Sure, you have the potential to cause huge amounts of damage, but there is just as much chance of clearing out your Field for your Opponent’s next turn. It was an action that I honestly could not really figure out the best use of. That was until I saw Kim (from Dice Masters in the Great White North with Reg & Kim) run it recently in one of our TOTM, the WDA, and she is running it in the current Two Team Takedown. Her version of Orbital Strike makes use of the OP Wolverine who has the Regenerate ability. Brilliant! This would give me a chance to keep things in the Field after Orbital Strike went off. Focus on character who can Regenerate and maybe I can survive my own shenanigans. I decided to work off of Kim’s TTTD Team and strip out things that are more on the competitive side, and make it more of a casual build. I also chose to limit myself to Modern, just to see how it could run. Wolverine is such a good stated character for a 4 cost, so I kept him in. Instead of going the Doppelganger route, I chose to sub in Mindless Ones. Again, decent stats and the built in Regenerate ability. Ramp would be a challenge here, so I doubled up with the Rez and Fez Globals. Atlas also gave me a back up plan if things were going poorly. I decided to keep the Eye of Agamotto from Kim’s build just to see how it would work. I paired it with SR Malekith so in essence, I had an expensive and less efficient version of the old Chalkboard Global. This Team has zero control as it is. I am fine with that, but there were a few things the could totally wreck my night. Rare Bishop being one of them. I put Harley on the Team to pair with Malekith to try and KO bad things on the other side of the table. The last piece, I decided to go with Bifrost. Laurier has shown how good it can be at getting things out quickly, so I wanted to test it out myself. Let’s see how things ran. Did I mention that there were a few things that could totally wreck my night. GDM (Green Devil Mask) was the other one I was concerned about… and here it was. Long story short, once GDM hit, my Field just was not holding together. Tabaxi also slowed my Ramp. Basically, a total mismatch. The highlight of the game was my Hail Mary at the end where I decided to trigger GDM on purpose and hopefully reroll things back to then trigger Orbital Strike. Potentially, I could have won if everything came up right… it did not. Up against a classic old school PXG/Morphing Jar/Elf Thief/Parallax Build… oh yeah with the new Clayface Global along with the Yellow Lantern Ring. So, he was going to use the tools at hand to Intimidate out my Field and swing through for an easy win. With so many low cost characters and ways to disrupt my Ramp (have you ever experienced the Elf Thief/Parallax trick when you save masks?) he outpaced me by a significant margin. I am not even going to describe this Team, except to call it Gord’s Shitstorm Team. You can read about it later. I didn’t give him a chance to pull his shenanigans against me, but it cost me my Field. I got an Orbital Strike in for a little damage, but nothing significant. Gord won with lots of stats going though an open Field. So, tonight was a Strike-Out (at least I got a clever title out of it). This version was way too slow. Even with The Bifrost as a help to get characters out, it was taking too long to build the engine. The Rez/Fez Ramp did not work very well and I would be tempted to go with something like Thrown Brick (2 costs were lacking in this build and could definitely benefit from it). Malekith worked well with the Eye by getting Orbital Strike into the Bag at the right time. However, I am not convinced these are the best way to go about this. I feel something that helps with churn would make up for losing this on the Team. Harley did not roll all night, but I think she still fits the build. I didn’t get a chance to use her ability, but I think it could have been good. If she stays, there needs to be a KO mechanic on the Team (which Malekith serves well). Acererak also did not come into play. I never really had the spare energy to use the Global. This is one of those take it or leave it type pieces to be honest. Kim definitely cracked the Orbital Strike code with Regenerate, and Wolverine was a great addition to the fold. I am not sure that the Mindless Ones were needed to supplement the Team. I should have focused more on Wolverine by himself. The KCG would have helped a bit here to get a bit of a discount (3 cost is better than 4 cost). This Team has some fun potential, but not as I built it tonight. It absolutely needs a Regenerate character, but needs some help to deal with its Achilles Heel. GDM kills it, so there needs to be some protection against it (Rare Blob perhaps?). I think I took this too far into the casual direction and need to put some better tools back on it. Would I play this again? I think with a few tweaks, this can be fun to run. 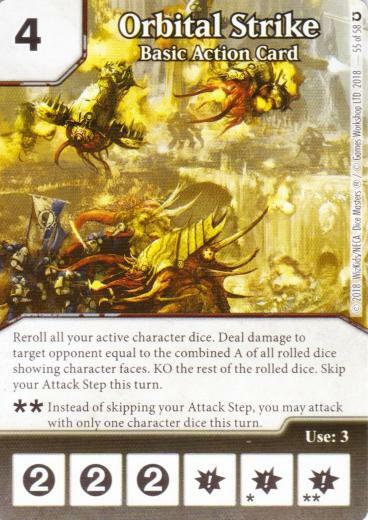 Orbital Strike feels like one of the most Dice Mastery cards out there. Anything that promotes rolling is a good thing in my books. Thanks for Kim for finding a good use of Orbital Strike. Have you messed around with this card? Let us know what you put together in the comments below. Green Devil Mask. My bad… I use abbreviations more than I should. I’ll make a little update to the article. Thank you. Also, I have never knew what you all mean by shenaninags. What is it? This looks like a fun idea and perfect for the super-Casual environment we’re using right now to try and ease some players back into the fold. I will definitely give some version of it a try. Thanks!